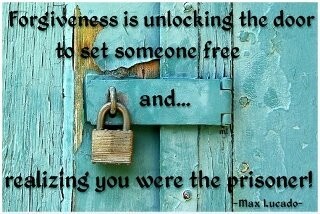 Forgiveness opens the door for change! I was sad to hear of the passing of Nelson Mandela yesterday. Over the years I have admired his decision to forgive and live out that forgiveness in his actions. He was a man that stood out because he didn’t respond to prejudism with hatred and bitterness. He had the wisdom to realize that real change in South Africa, would only come with forgiveness and reconciliation. Hatred would just prolong the fighting and nothing good would ever be accomplished. The Word of God teaches us this same principle. We are to live a life that demonstrates forgiveness. Our own forgiveness is conditional upon us forgiving others as we read in Luke 6:37 NIV 37 “Do not judge, and you will not be judged. Do not condemn, and you will not be condemned. Forgive, and you will be forgiven. Nelson Mandela was able to bring about amazing change in South Africa that eventually spread to other parts of the globe because he implemented this principle. I can’t help but think about the awesome opportunity for change each and every one of us that follow Christ have. In our families, in our churches, in our neighborhoods and in our world, we can all make a difference when we love like Jesus loves, when we refuse to judge and condemn and when we forgive. Christ does not want us to spend our time fighting battles of bitterness and unforgiveness. He wants us to use our time to love Him and serve others. My prayer is that we will not waste any more time walking in unforgiveness but will do as Paul says in Colossians 3:12-14 NIV 12 Therefore, as God’s chosen people, holy and dearly loved, clothe yourselves with compassion, kindness, humility, gentleness and patience. 13 Bear with each other and forgive one another if any of you has a grievance against someone. Forgive as the Lord forgave you. 14 And over all these virtues put on love, which binds them all together in perfect unity. If we start each day with this scripture in mind, we too will make an amazing difference in our world. ← Help yes! Enable NO!